Hundreds of people are reported to have been killed in Nigeria's Plateau State in clashes between Muslims and Christians. The latest violence is apparently revenge for similar clashes in January. 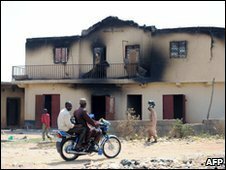 More than 2,000 people have been killed in communal violence in Plateau State since 2001. They are usually reported as clashes between religious groups but the underlying issues are political and economic. Religious, ethnic, political and economic divisions in Plateau State overlap and reinforce each other. Muslims are generally from the Hausa- or Fulani-speaking communities. They are often nomadic people who live from rearing animals or petty trade. In Plateau State, they are seen as supporters of the opposition All Nigeria People's Party. The mainly Christian Berom, Anaguta and Afisare groups have traditionally been farmers and generally back the People's Democratic Party - which is currently in power at both state and national level. But any disputes over access to land or power quickly take on a religious dimension. Jos, the state capital, is now divided into Christian and Muslim areas. Why can't the two groups get on peacefully? In Nigeria, access to power is often seen as a way of making money - both for yourself and your community. Some 80% of Nigeria's GDP flows through the state and local government system. So unscrupulous politicians will often do anything to get elected, or remain in power - such as whipping up ethnic or religious hatred and driving groups seen as supporting rival candidates from their homes to stop them voting. The situation is exacerbated by Nigeria's system of classifying its citizens as "indigenes" and "settlers". This system is nationwide but in Plateau State it perpetuates the local divisions. The Hausa-speaking Muslims are classified as "settlers" even if they have lived there for generations and have no knowledge of their "home" region. "Settlers" are banned from taking some positions in state government and the state does not pay for their education, meaning these groups feel discriminated against. While some people may feel the only way they can change the situation is to use violence, the Christian groups in power may stop at nothing to to retain the advantages they enjoy. The authorities are sending the army in to stamp out the violence, amid fears it could spread to other areas. But it will take some time to address the underlying issues. In 2004, the federal government took the unprecedented step of sacking the state governor, Joshua Dariye, for not doing enough to stop a previous outbreak of religious violence. Mr Dariye, from the PDP, called himself a born-again Christian and had been quoted as insulting Muslim groups. No similar action has yet been taken against the current state government. Human rights group warn that the violence will never stop until action is taken against those who organise it. After January's violence, they called on the International Criminal Court to investigate. The situation is further complicated by a power struggle at the national level between supporters of ailing President Umaru Yar'Adua and acting President Goodluck Jonathan. And there is a national election due next year, making it even more difficult for the national government to take strong, decisive action to stamp out the violence, in case it alienates potentially important political groups.